Potted plants can bring a great splash of colour, making great use of limited garden spaces, and keeping invasive plants we love where they should be. However, on a really hot, dry day they lose moisture faster than you might think. This is especially true for hanging baskets that tend to catch a lot of sun and wind. Ways to combat moisture loss include the use of water retention spheres, which soak up moisture and release it gradually once mixed into the soil, or you can even line the bottom of your pots using shredded bark – ti-tree is especially good for lining hanging baskets. Setting up a daily watering routine means you’ll never miss a plant or worry whether one section of your garden has been sufficiently watered or not. Underground irrigation systems with release automation take all the hassle out of watering, and they’re well worth the investment. Also, pre planning by marking up an outline of garden sections in your yard can also be really helpful if you need to break your watering routine up in order to get through it. 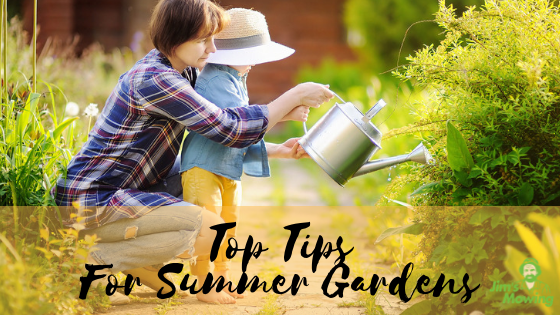 Watering alone in the summer months alone just won’t do- at this time of year, your plants are working hard to produce the fruit, flowers and foliage that make them look so great. If they aren’t looking so great, it’s possible that they’re missing out on important nutrients, or they may even have a pest problem. If you’re not sure, the wrong booster can be useless, or worse, do damage to your plants. Check with your local Jim’s Mowing professional to see which boosters would be best suited to your plants. No one wants to find out the hard way that pests have overrun their favorite trees or shrubs. Sometimes, the damage can be too far gone before you notice it. Elm leaf beetle can spell doom for a grown Elm tree, so be sure to act on any discoloration, unusual dryness, or papery leaf sections. Especially in the case of whitefly and spider mites which tend to go for potted plants, pest checks are critical at this time of year when these insidious little creeps are after the goodness in every leaf. Check the backs of your tomato leaves and dust accordingly.